After becoming a parent, one of my favorite things to do was begin family traditions. We all have a few that we continue from we were children. However, after starting your own family begin unique traditions that are all your own are special and exciting to plan. The Spring before we lost Ryan we had started a 'Spring Garden' tradition. We planted a bed of bell peppers and green beans. He was thrilled to go out each morning to see if anything had sprouted yet. I am not quite sure he grasped the idea of getting to eat what we grew, he just loved the act of gardening. Getting dirty, getting wet, being outside...what most little boy dreams are made of. We did see some growth which was pretty incredible to see through Ryan's eyes. A child's excitement is unmatchable and to experience your own child's pure excitement can shake you to your very core it is that intense. I adore Ryan's excited face and sounds. Ryan passed before we could reap the benefits of our harvest. My father in law actually took a few of our plants and they now grow in his garden. This Spring I decided that our family would pick back up our 'Spring Garden' tradition. I know Ryan would have wanted to plant again. I was feeling this determined, yet happy feeling of accomplishing something with my two children for the first time. I thought, "this is what it will be from now on. doing things with both my children. one here, one there and yet still all together" it actually was pretty neat. We went to the store and picked up everything we needed. I bought a sign to put my children's name on because I wanted to feel and see Ryan as much as I could. The day we planted was a beautiful one. Warm, but not too warm. Spring was definitely wafting warm though us within the slight breeze. Or maybe it was Ryan running around us. I had Mila in my lap to start. Her little legs kept kicking over the mini pots once they were full of soil. A hint of frustration crept up on me, and I laughed because had Ryan been physically here the soil would be a giant mess and in the end we'd all be covered in it. So this is what its like doing things with both my children. I love it. I am learning to love it. We potted a few herbs and veggies we like. We live in an apartment so our garden lives in white pots on our third floor balcony. Which is actually kind of perfect since the sun hits just right there. Just after two short weeks we saw some growth happening! Dan spotted it first and we all gathered outside to see! Come time to eat our harvest we will do it together. Ryan and I did a lot of crafts. We always were painting new pictures to hang from the mantel or tape to our kitchen wall. Recently he was into painting and learning how to use markers. I had bought him a large marker set for Easter and we practiced using the colors and then putting the lid back on when finished. He loved snapping the lid back into place. He also loved coloring on things that were not paper. I find myself thinking of when I would scold him for coloring on himself or the carpet. I smile a bit, but I feel this deep rooted sadness at the same time. I wish I could have him back and would let him color all over the place. This deep sadness, I don't know what to do with it. As I mentioned it before, it sometimes takes my breath away. Sometimes it makes me cry with out warning. Sometimes I can ignore it and move on for a bit. Either way it is there and it is scary because I know it won't ever go away. I'm scared that I will feel sad for the rest of my life. To deal with the sad feelings I keep busy. I keep busy to try and keep the sad at bay. Recently, in efforts to keep busy I've been doing a few crafts or cooking. Last week I make mosaic stepping stones for my sister's backyard, salted caramels, and spaghetti and meatballs for my family dinner. 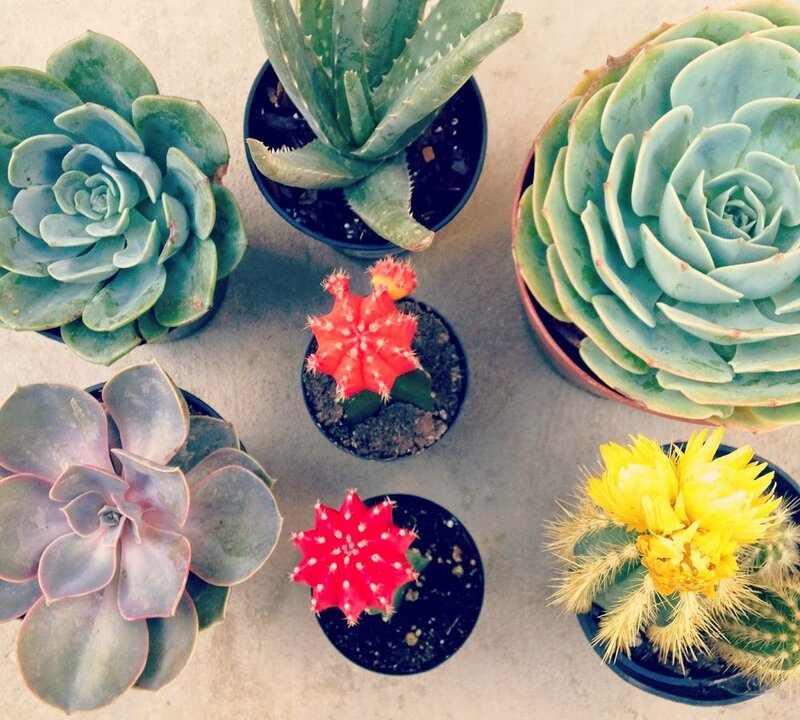 This week I painted pots and planted a bunch of beautiful succulents. And one tiny red cactus for Ryan. It all feels therapeutic. I absolutely adore the way my succulent garden turned out so I thought I would share. 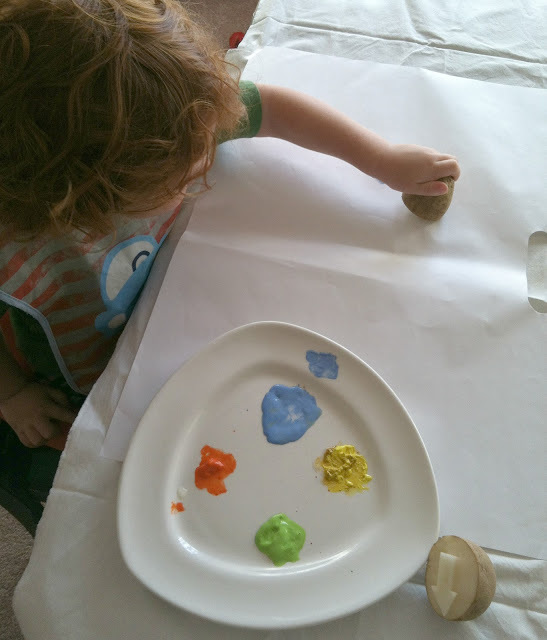 This week I decided to brave my fear of 'giant un-cleanable messes' and break out the paints with my toddler. We have painted a few times before and each time it has ended in near death. Ok I'm exaggerating. However, trying to reason with a toddler who wants to body paint instead of create art on paper is hard! This week I guess I was feeling optimistic! Plus, the sheer joy painting brings to my kid is incredibly infectious. I just become a giant mush pile watching him smile and have fun...even if he is making a giant mess. Since we started this whole paint thing I have learned a few tricks that helped keep the piece during art time. I've decided to share them here with you all, I hope it helps the clueless and brings a smile to all! `If you paint outside...good for you! You are smart. If you are like me and decide to paint inside, start by covering the floor, table and chair with old sheets. These old sheets have now become our art sheets. `I like to tape the sheet to the table so it doesn't move while my mini-Picasso works his magic. `Next I tape a piece of butcher paper down. Again so it doesn't move. `We have tried finger painting and I would rather stick a fork in my eye. Honestly. There are probably paint brushes out there for toddler's chubby hands...but I found the cheapest and most fun way to paint is with potato stamps! My mom and her best friend use to make these for us when we were kiddos and they are pretty rad. And super easy! Plus the potato fits nice and snug in a toddler hand. Double plus, listening to my toddler say potato stamp is hilarious! "Taato sss fampt"
`See! Super easy. Just be careful not to cut your fingers. `Another good thing to remember is start out with using the smallest amount of paint as possible! Seriously, like dime size squirts of paint on a plate. (washable paint of course) I found that starting with a generous amount of paint began a paint frenzy. Sort of like "ahhhh all this paint!! I must smear it all over everything including my body!!!" With small portions of paint, I could control how much paint my toddler actually used. `Always start art time after a nap. Or whenever your toddler is in their best mood. This usually helps bypass any meltdowns, where paint can be thrown, pushed, splashed etc. If your toddler doesn't have meltdowns...email me your secret asap. `Always make sure you have enough time to actually create art. Once I decided to start painting with my toddler, and a half hour into it we had to pack it up and leave. This resulted in another meltdown because I'm sure my toddler was feeling inspired and didn't want to stop his creative juices flowing. Whatever the case might be, it is important to allow time for your child to think, create, play, create and finish their project. Unless of course your kid is milking art time way past bed time. Then feel free to cut.them.off. `Lastly, set up some paper for you! I found that having my toddler watch me paint with him made him more happy. It also gave me a chance to show off good painting etiquette. He copied me exactly...which meant no paint anywhere but the paper! If we keep this up...we may paint again tomorrow!